FEATURES: The flexible EPDM cap eliminates roof leaks because penetrations can expand, contract, and vibrate independently of the roofing system. Used together with Alumi-Flash or Plasti-Flash Base. 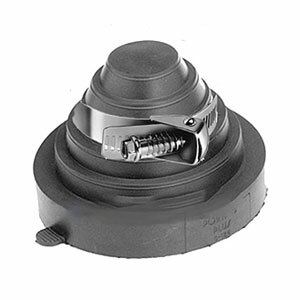 The EPDM cap is mechanically sealed to the Alumi-Flash or Plasti-Flash base by a double "Weather-Tite Pressure Seal", which consists of two beads formed into the collar of the base that mate with double grooves molded into the inside of the cap. The Portals Plus Alumi-Flash provides a permanent, watertight, and maintenance-free means for penetrating roofs that is simple and easy to install. Optional adapter Rings can modify these penetrations. OPTIONS: There are five different cap styles available which can accommodate a variety of round pipes, tubes, and conduits from 3/8" round through 12" round, and, with Portals Plus Adapter Rings, angle irons and square tubes, as well.